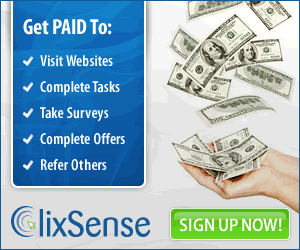 GoldenClix is a PTC site that pays members by viewing ads. It also has a referral program and other earning platforms. Membership is free, with upgrade option to receive bigger earnings, incentives and benefits. The minimum payout is $5 which you can receive using the following payment methods: PayPal, SolidTrustPay, Liberty Reserve and Payza. Points – any activity you make on the site earn you points. 1 click=1 point; 1 completed offer=5 points; 1 new direct referral and for every dollar deposited=10 points. Points can be converted to upgrade account or purchase ads. 5000 points=$1. Referral earnings – you get 35% of click value for standard ads and 3% commission for ad purchase. PTSU – complete sign up offers to earn from $0.10 – 0.30). Over 10 declined submissions prohibit you to complete any PTSU offers anymore. Advertisers approve or decline offers submissions within 7 days. Grid Game – View the ad (5 seconds). You get a notice if you won or to try again. The winning prize (up to $2) is credited to your account immediately. Standard members have 20 chances/day. Cashout Options – minimum first cashout is $5, which is reduced to $2 for succeeding payout requests. Although a new PTC site, GoldenClix looks reliable considering that payment is quick and several earning options. However, it can be classified as a bux site, which means it may not be able to sustain the payments for lack of advertising income to the cost of self-sponsored ads.